The first step is measuring your material. 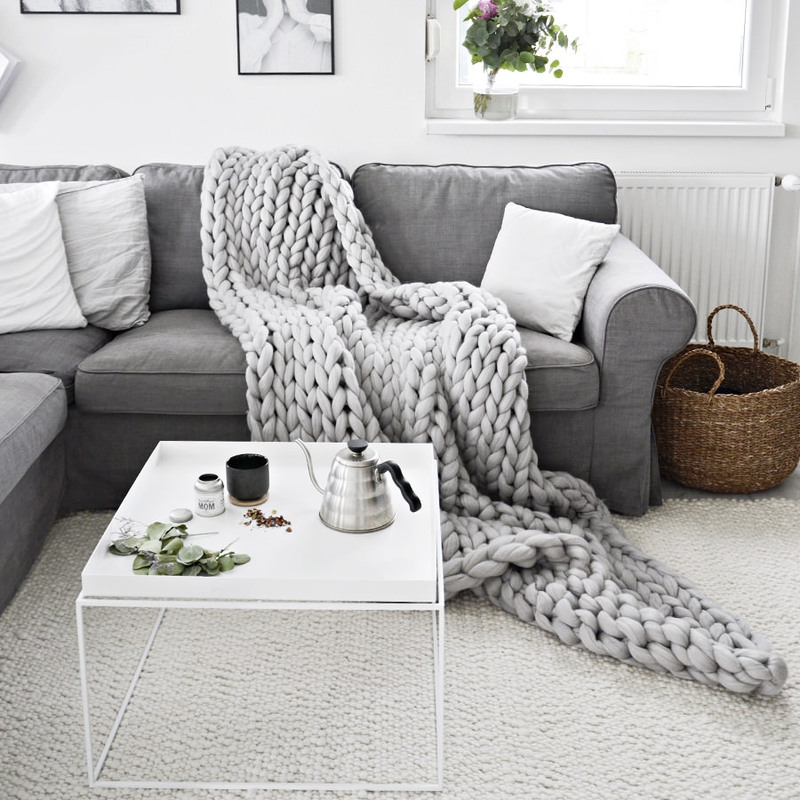 To make a medium blanket you need to measure out four pieces about the length of your arm span. Three for a small and five for a large. Your first move is a knot that separates the Braid you’re going to be using for your arm knit blanket and the shorter end that you’ll be weaving into the corner once you’re done. Cast on 16 stitches for arm knitting a medium blanket, 11 for a small and 22 for a large. The hardest part is over! Now, one by one, take each stitch that you have on your arm, and weave Braid into it, creating another stitch in the process. Put the stitch on your free arm, and make your way through the stitches you’ve already cast on. Repeat the process, but in the opposite direction: take a stitch, pull Braid through it, and put the resulting new stitch on your arm. Remember that they all have to face the same direction, unless you want an uneven blanket. This is the fun part. Repeat the first and second rows until you have a full blanket. 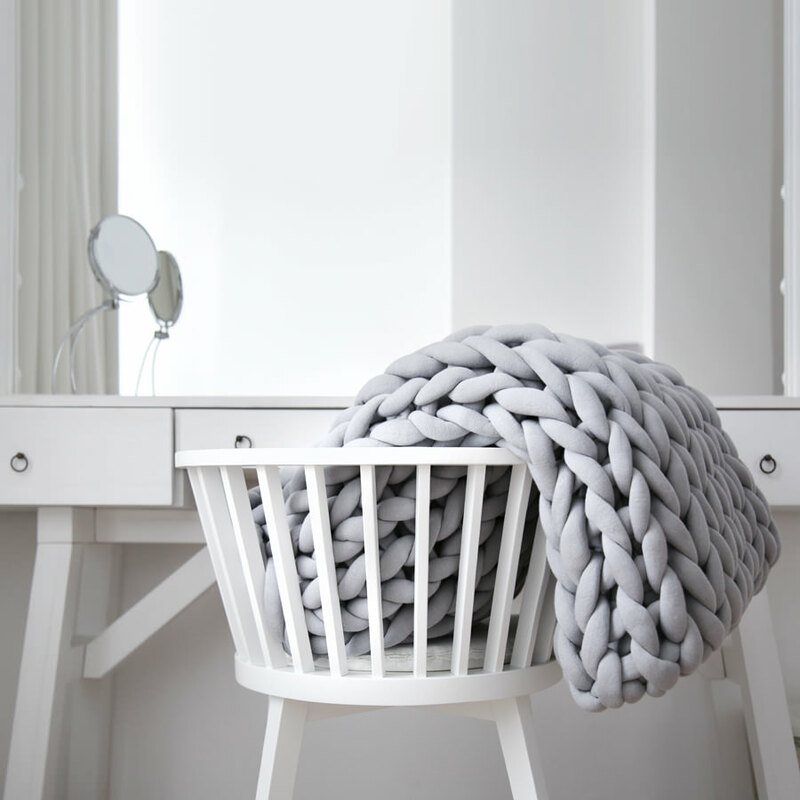 For a medium throw, you’ll need 31 rows; 25 for a small and 41 for a large. Once you’ve reached the desirable length, it’s time to finish. Here’s how you cast off: remove two of the stitches you have on your arm, and pull Braid through both of them, creating a new stitch. Add to it another stitch that you took off your arm, and so on until all you have is a piece of Braid. Create one last loop with it, and tie it into a knot. You’re going to have two loose pieces of Braid left over on opposing sides of the blanket you just finished. Weave them into a corner and along the side of the blanket. They have a selection of options - you can just buy the braid to follow the tutorial above or opt for a kit containing everything you need. They have a massive choice of colours so you’re bound to find one to marry up with your colour scheme.